Despite advantages over traditional surgical methods, advanced surgery procedures present limitations, and these could be overcome by the use of refined virtual reality systems. So says a new report from Kalorama Information. The report, Virtual Reality and Augmented Reality (VR/AR) Market in Healthcare (U.S. Markets for Surgery; Medical Education and Training; Pain Management, Rehabilitation and Therapy), predicts that virtual reality technologies in healthcare could near a $1 billion dollar market in the next few years. Laparoscopy and endoscopy are performed without the natural line of sight for the surgeon available in open surgery. The small incisions and reliance on endoscopic or laparoscopic feeds limit surgeons to a narrow visual frame of reference. Surgical navigation or image-guided surgery (IGS) systems already utilize virtual models for navigation and to guide surgical intervention, but in some cases are limited by the resolution or parameters of the virtual environment (VE), whether two-dimensional (2D) images or lack of segmentation. Robot-assisted surgery systems encounter problems inherent to both laparoscopic/endoscopic and IGS systems such as a limited visual frame of reference at the surgical site or inadequate resolution for precise navigation and intervention. Radiotherapy has improved over the past several decades in terms of its precision. The latest systems are intensity-modulated (IMRT) and image-guided radiation therapy (IGRT) systems that use image guidance and sophisticated delivery models. These systems seek to deliver optimal dosage within the tumor target while minimizing exposure to surrounding tissue through precise patient alignment and tracking of patient movement relative to the simulation or treatment model. 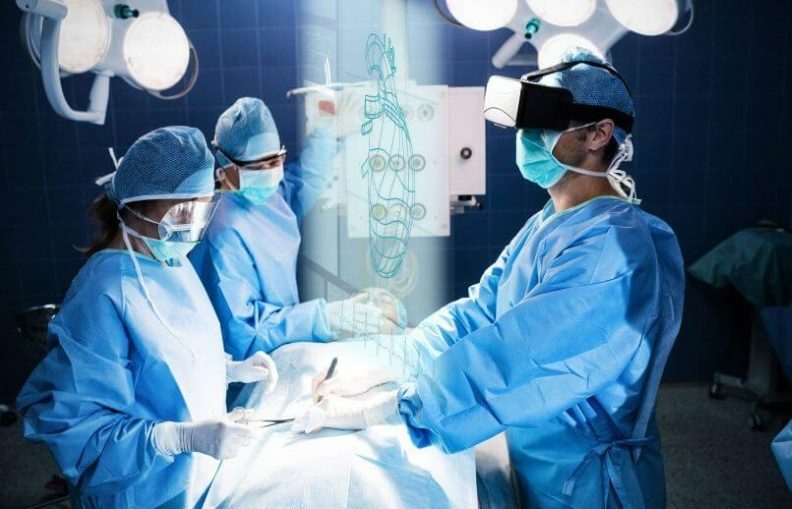 Virtual reality (VR) and augmented reality (AR) principles and technologies have already been introduced into surgical navigation, RAS, and radiotherapy systems. Most common is the utilization of pre- and intra-operative medical imaging to construct simulations or models of patient anatomy, whether for the navigation of surgical instruments, intra-operative segmentation, labeling of key anatomical structures, or targeted delivery of radiation. Augmented reality and virtual reality are uncommon in the lexicon of lexicon of navigation, RAS and radiotherapy platform vendors that have yet to incorporate VR/AR headsets or fully immersive qualities to their systems. Nevertheless, many surgical platforms are already incorporating capabilities analogous to VR and AR technology and are moving closer to AR image injection and more interactive and immersive virtual models.